Wedding photos are real treasures. An investment you will never forget or want to be damaged. Through the years this picture yellowed from the oils in the paint used to color the photo and the acids in the paper. 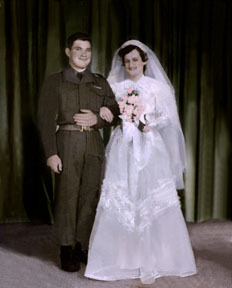 The wedding dress had tears, rips, pen marks, creases, all which were removed with photo restoration techniques. 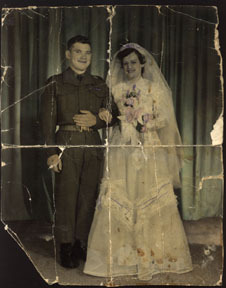 Go through your wedding photo album, find some pictures that are faded or flawed in someway that you would like restored. We can fix your wedding photos like new. Restore your treasured wedding day photos, enhance wedding photos that are dark or faded, repair flaws, replace distracting backgrounds or objects, remove unwanted people. Your wedding party pictures are important. So take a look at your wedding album, repair your wedding day photos to help protect your wedding memories.